Camera guns have been used as a gunnery training aid since the 1914-1918 war, when in 1916 a sight recording camera was designed at the RFC machine-gun school at Hythe in Kent. This camera gun, made by the Thornton Pickard Co. of Altringham, was similar in shape and weight to the Lewis gun. It proved to be very successful in assessing the standard of gunnery in the air. Known as the Hythe Gun Camera Mk III, it took still exposures on a 120 mm film roll. Provision was made for a multi-ring reticule and the time of exposure. The trigger, cocking action and balance were all identical to the Lewis, and a drum magazine was clipped into place. It was used mainly on Scarff ring mounts, but was also fitted onto the top wing of fighter aircraft, controlled by a Bowden cable. The camera gun itself is a very interesting piece of equipment. In form and weight it is modeled after the original Lewis Gun (photo below for reference). The box contains the film and a glass reticule that has a ‘target’ imprinted on it. When the trainee ‘fires’ the gun at a target plane the reticule’s grid is imprinted on the film with the photo of the targeted plane. The target plane appears in the developed photo, hopefully within the imprint of the reticule’s target. In addition, the trainee was supposed to change the magazine (in flight) after each shot. There is a unique pin that pierces the film each time the magazine is changed. If a photo appears without the ‘pinhole’ it indicates the magazine was not changed. “Can’t get away with anything! Potentially a major, advance in air warfare, the Gotha bomber was Germany’s major weapon in her attempt to subdue England’s civilian population in World War I. From it arose the misguided belief that terror bombing could win wars. ‘How is it, after three years and a half of war, that such raids can be undertaken over London with impunity, and that these Gothas should escape unscathed ?’ This question, asked in the British House of Commons and reported in the ‘Daily Express’ of 30 January 1918, typified the concern felt about the effects of the terrible innovation of ‘aerial bom­bardment by heavier-than-air’ machines of a civilian popu­lation, wrought by the German Gotha GV, its most formid­able exponent to that date. There was also more than a touch of politicking in the question for, in 1918, improved British defenses against the Gotha, coupled with its unreliability, particularly in bad weather, were steadily reducing its effectiveness. But this was little consolation to the Londoners who, attracted by the uneven throb of aircraft engines, had stared into the mid-morning sky on 13 June 1917. People pointed up towards the 14 gleaming white planes that cruised steadily southwards at a height of 15,000ft. There was even some patriotic cheering to welcome what was assumed to be a British patrol. Then suddenly the harsh bark of anti-aircraft guns reverberated in the warm air—the aircraft were German. Astonished faces showed a realiza­tion that the hated enemy could fly above the nation’s capital in broad daylight. High above the city in his twin-engined Gotha, Captain Ernst Brandenburg identified the famous landmarks coming into view below him. Behind Brandenburg’s lead ship, his squadron deployed to commence the attack. Then the bombs rained down on the capital. Many of the people in the area of the attack seemed too stupefied even to take cover. High explosive bombs fell across the eastern dock area at 1135. Five minutes later, 72 bombs landed around Liverpool Street Station, a main rail terminus and the Germans’ main target. Their mission complete, and hardly daring to hope that they might get away safely, the Gothas headed east for the North Sea and their bases near Ghent, in Belgium. In London the capital mourned 162 dead. The concept of the long-range strategic bomber attacking major urban centers was born and with it the Gotha legend. The original Gotha was a clumsy twin-engined biplane, with the fuselage suspended from the upper wing. It was evaluated operationally by the Germans in 1915. Between 12 and 20 GIs (G for Grossflugzeug, or ‘large aircraft’) were built before the end of 1915, but work was already proceeding on a superior design, the GII. This new Gotha was a far more elegant biplane than the GI. The fuselage was mounted in orthodox fashion on the lower wing. There were three crew positions—the observer, usually the captain, sat in the nose with a swivelling Parabellum machine-gun, a connecting corridor led to the pilot’s cockpit, and the third member of the crew was the rear gunner, whose position was level with the trailing edges of the wings. The 220hp Mercedes DIV engines drove pusher propellers and were installed in bulky nacelles which incorporated fuel and oil tanks. The next Gotha type, the GIV, differed only in detail from the Gill, the most significant alteration being the incorporation of the famous Gotha ‘tunnel’. This was a long opening cut out of the bottom of the fuselage from the rear gunner’s position back to the tail: it enabled the upper gun to be directed downwards through a small triangular aperture in the top decking to fire at any hostile fighter attempting to approach the bomber’s blind spot. When fully or half loaded, the GIV proved to be a stable aircraft to fly, at the same time retaining a high degree of manoeuvrability; once empty, however, it was difficult to handle, with a pronounced nose-heavy trim—crash landings, as a result, became commonplace. The GIV was the aircraft that was to undertake Germany’s Operation Turk’s Cross, the aerial bombardment of Britain by heavier-than-air machines in support of the airship raids that were already in progress. A special squadron, designated Kagohl 3 and soon to be known as the England Geschwader, was formed with this express object. The Gothas were scheduled for delivery by 1 February 1917, and in the meantime crews went to Heligoland-and Sylt for training in the techniques of navigating over the open ocean. In 1916 the bleak waters of the North Sea were a formidable barrier to aircraft and, as insurance, the GIV’s plywood-covered fuselage was designed to enable a ditched plane to remain afloat for several hours. After two months with the G IV’s the England Geschwader was ready to launch Turk’s Cross. Brandenburg’s first attempt to raid England ended at Nieuwmunster when last-minute storm warnings led to a cancellation of the mission. On Friday, 25 May 1917, at 1700, however, twenty-one Gothas flying at 12,000ft crossed the Essex coast. Their target was London, but as they reached the Thames near Gravesend, only 20 miles from their objective, bad weather forced them to turn south in search of alternative targets. The Gothas scattered bombs haphazardly across Kent until they reached Hythe, where they headed eastwards along the coast. Late in the afternoon they arrived over Folkestone. The Gothas made the best of their escape, harassed out to sea by anti-aircraft fire from Dover and a handful of fighters. A British naval squadron at Dunkirk was sent up to cut off the raiders’ retreat and succeeded in bringing down one Gotha, while another was lost near Bruges. These were the only German casualties. In England, 95 people had died and 195 were injured. On his return, Brandenburg was flown to Kreuznach to receive the Pour le Merite from the Kaiser. As he took off for the return flight his plane’s engine spluttered and he crashed. Brandenburg was dragged from the wreck alive, but the disaster cost him a leg. Only three days later, on Saturday 7 July, the Gothas appeared over London again, 22 strong. But before the raiders had reached the English coast British fighters were in the air to intercept. Among them, in a Sopwith 14-Strutter, was 19-year-old Lieutenant John E. R. Young with Air Mechanic C. C. Taylor as rear gunner. The Sopwith climbed steadily out to sea until the massed bomber formation was-spotted approaching on a collision course. Lt. Young aimed his aircraft straight at the oncoming Gothas. It was a valiant but suicidal gesture. The frail biplane was bracketed by concentrated fire from the score of German aircraft. Bullets riddled the Sopwith’s wings and fuselage, killing both the crew instantly. Lieutenant F. A. D. Grace of 50 Squadron from Dover had better fortune and shot a homeward-bound Gotha into the sea. Four other bombers crashed at their bases trying to land in gusty wind. Bombs fell on widely scattered targets, mostly in the north-eastern parts of the city, killing 57 people and injuring 193. Gothas raided Harwich on 22 July and for the next raid, on 12 August, Chatham was the objective, with Southend and Margate as secondary targets. British fighters, 109 in all, were up to meet them. Unteroffizier Kurt Delang, flying only his second mission over England, was forced to take violent evasive action in his heavily laden Gotha as a scout flashed by in a firing pass. He frantically rolled the big bomber to left and right as the British fighter came in again from behind. Machine-gun bullets crashed into one of the Gotha’s ailerons and threw the plane on its starboard wing tip. The over-confident Englishman closed for an easy kill —and missed I As the scout swooped below the Gotha and climbed for another attack, Delang’s gunners found their mark at last, and the British fighter dived away with smoke pouring from it. Anxious to redress this setback, Kleine ordered another raid for 18 August. Despite clear skies, his meteorological officer forecast severe winds over England and advised against the mission. Kleine ignored the warning and took off. The result of his impetuosity was the disaster of ‘Hollandflug’. Strong south-westerly winds swept the Gothas over neutral Holland, where AA guns opened fire. After three hours of buffeting they finally reached England, some 40 miles north of their intended landfall. With fuel running dangerously low, Kleine was forced to turn back, but the Gothas were swept across the North Sea by a gale that again blew them towards Holland. At least two planes ditched, others were forced down in Holland and Belgium, and many of those which did finally reach Ghent crashed on landing. The answer to the problem of heavy losses in daylight raids and reduced performance was to attack at night. On 3-4 September four volunteer crews, led by Kleine, took off in a hazy night with a full moon. The targets of the trial raid were Chatham, Sheerness and Margate. Anti-aircraft fire was sporadic and British fighter planes were not equipped for night flying. A bomb dropped on Chatham hit a naval barracks and 132 ratings were killed. Of the attack on the naval barracks, the ‘Evening News’ of Wednesday 5 September stated that ‘Reports from the Chatham area all appear to indicate that the damage in that district was the work of only one raider. Eight or ten bombs were dropped, and one fell on a portion of a Royal Naval Barracks, which was fitted with hammocks for sleeping, and 107 blue jackets were killed and 86 wounded. It is feared that two or three of the injured will not recover … The raiding machine is believed to have been of the Gotha type. All the German planes returned safely from the raid. The next night nine Gothas set out to attack London. Only five reached the city which was not blacked-out and glittered like a beacon to guide Kleine’s crews. The ‘Evening News’ on 5 September led with ‘Invasion by moonlight’ and described the effects of the attack in various parts of London. ‘Some of the bombs’, the newspaper reported, ‘as they fell caused a sharp whistling sound ; and when they exploded there was little or no report . . . Other missiles, however, gave very loud reports—louder than those which were remembered in connection with the Zeppelin raids.’ The civilian population, having their first taste of night bombardment by heavier-than-air machines, apparently kept calm : ‘There was no panic among the inhabitants, but large numbers of women and children living in houses near the Tube rushed for shelter below ground, and were taken down in the lifts to the underground platforms.’ The sky was streaked with searchlights and anti-aircraft guns opened fire—but their effect was, according to the ‘Evening News’, ‘not apparent’. The first Gotha night raid on London cost 19 dead and 71 injured. It also caused £46,000 worth of damage. By this time Kagohl 3 were taking delivery of the Gotha GV. The GV had a lighter but stronger airframe than the GIV, with the fuel tanks removed from the engine nacelles (where they frequently burst in the event of a crash) to the fuselage. As a result of this re-location of the fuel, there was no longer a gangway connecting the rear gunner’s position with the cockpit. Despite a gross weight of nearly 9,0001b, the maximum speed had risen to 87mph with a ceiling of 21,000ft. One Londoner described the bombing of his house to the ‘Star’ of 1 November: ‘The man said that they heard the raider humming overhead and were looking at the shell bursts through the window’, the ‘Star’ reported. ‘ “The humming became louder . . . and then I heard a whistling noise. There was a bright green flash and a fearful concussion. The house shook to its foundations, and I thought it was going to crack. The wardrobe in the corner of the room was thrown over, and we were nearly choked with fumes and dust. A mass of plaster from the ceiling crashed down and a large piece just missed the heads of my children. We escaped from the building by the staircase, which was undamaged”: His experience was clearly more frightening than that of another Londoner, reported in the ‘Star’ the same day—he slept through ‘ “the whole business. He refused to get up while the raid was on”.’ British casualties in this raid were fairly light as most of the incendiary bombs failed to ignite. Five Gothas, however, crashed in fog when trying to land at their bases. On 12 December Kleine was killed during a daylight raid on British troop encampments near Ypres. His 17 Gothas were bounced by three Royal Flying Corps Nieuports at 10,000ft over Armentieres. Captain Wendell W. Rogers, a 20-year-old Canadian pilot of No 1 Squadron RFC, closed to within 30ft of the tail of Kleine’s Gotha and poured a sustained burst into the huge bomber, which began to glide steeply down towards the trenches below. At 4,000ft it burst into flames: two of the crew jumped without parachutes, the third died as the plane crashed and exploded in No Man’s Land near Warneton. As had happened with the GIV, the performance of the GV deteriorated as loads increased and serviceability declined, and the 19 May raid had been carried out from only about 5,500ft, whereas earlier night missions with GV’s had been at over 8,000ft. Bombing at such low levels was bound to be expensive. It has been suggested that the Gotha was a copy of the British Handley Page 0/100, an example of which fell into German hands at the beginning of 1917, but this is incorrect. The 0/100 had 275hp Rolls Royce engines giving it an endurance of eight hours with a bomb load of nearly 1,8001b compared with the Gotha’s of six hours endurance and about 1,100lb bomb load. The consequences of the German raids on England during World War I were far reaching, and the symptoms of panic which they invoked in London led to a mistaken belief that bombing attacks could break the morale of civilian populations. The potential of bombers in the ‘1930s was greatly exaggerated and it was feared in 1938 that the Luftwaffe could pulverize London in a matter of weeks. The bogey of the bomber was certainly an influential factor in persuading the British Prime Minister, Neville Chamberlain, to sign the notorious Munich agreement of September 1938. In 1940, however, the Luftwaffe’s bombers proved too small to accomplish the destruction of London and the Germans came to regret their neglect of the four-engined heavy bomber. The Germans first attempted to break British morale by launching a series of Airship raids on Great Britain – (only Airships had the range and bomb capacity to attack Britain in 1915; heavier than air aircraft had not been developed enough to be used). By 1917 it was apparent that the airship raids had failed because they were too vulnerable to AA fire and British fighter aircraft, aided by searchlights. It is an interesting window into the future that the last German Airship to be shot down was shot down by a naval Lt. S D Culley, who took off at sea from a towed lighter flying a Sopwith Camel – the precursor of the aircraft carrier. Following the failure of airships, the next German attempt to break British morale was to use heavy bombers, ‘Gothas’ and the very large ‘Giants’. These could carry 6 hundredweight (300 kilograms) bombs. Daylight attacks, starting in May 1917, failed due to British Home fighter defence and night attacks were accordingly started, the “Moonlight Raids” . However British defences included AA guns, formed into a barrier some 25 miles from London, were sited to split up the attackers and make them more vulnerable to fighter aircraft. The raids were tracked by Sound Locators and the defences in the path of the attack were alerted. The Sound Locators were very effective for identification of the Gothas but the Giants were so noisy that they initially confused their operators who thought that the Giants were Gothas but were much closer! The biggest air-raid of the war was to be combined with the German March 1918 Offensive against the British on the Western Front; forty aircraft set out but only 13 reached London and ten crashed during or after the raid. The statistics of the German aeroplane offensive are instructive, demonstrating how Airpower could not possibly have succeeded in attaining victory, nor indeed in inflicting any significant damage to the Britain’s war effort. 1916 – 19 attacks, three tons of bombs dropped – killed 27 and wounded 67. 1917 – 27 attacks, 51 tons of bombs – killed 655 people and wounded 1553. 1918 – 6 raids, 22 tons of bombs- killed 182 people and injured 430. During the whole war, 9000 bombs, weighing 2890 ton, were dropped by 51 Airship and 52 Aeroplane attacks. London was bombed 12 times by Airship and 192 times by aeroplanes. Overall, in Britain during WW1, 1413 were killed by the air raids, 3408 were injured and London lost 670 killed and 1962 injured. No source given for these numbers but the book’s bibliography does include Morris’s book which is listed with a copyright date of 1920. Did the British ever successfully bomb Berlin in WWI? 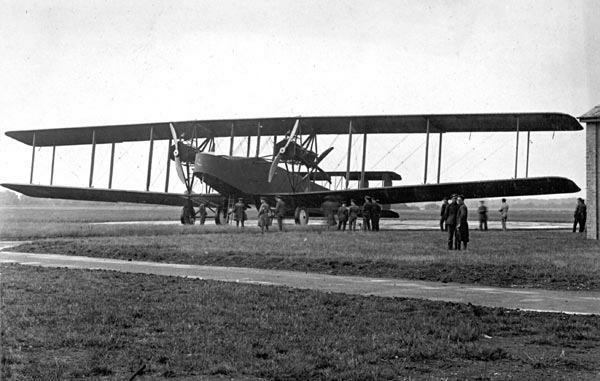 The The Handley Page V/1500, which first entered service in 1918, was the first British bomber with four engines. It was known within the fledging RAF as the ‘Super Handley’. Two squadrons were formed at Bircham Newton (No. 166 Squadron and No. 167 Squadron) with the express purpose of bombing Berlin. The short answer is no. As to why, that requires a very long answer. Briefly, 27 Group RAF based at Bircham Newton in Norfolk was Trenchard’s chosen instrument for raiding Berlin. It was commanded by a Canadian, Col. R.H. Mulock, which was to be equipped with the Handley Page V1500 bombers (the British answer to the German Giants). The RAF planning staff projected a round trip from this base of 1000 miles; the V1500 was supposed to have an endurance of 14 hours cruising at 100 mph, and with a bomb load of about 2 tons. The V1500 had four Rolls Royce Eagle VIII engines of 375 hp each. Allied plans for 1919 would have bombing Berlin with the Handley-Page V.1500. The RAF had plans in motion to have a 200 Squadron bombing force (Independent Force) by July 1919. The pieces were coming together at war’s end, but I doubt that the date would have been met. Think of the logistics to support this force. The HP V1500 were going to bomb Berlin from bases in Scotland! Three V1500 were delivered to No. 166 Squadron at RAF Bircham Newton (Norfolk) during October 1918. The squadron commander did not get clear orders for his mission until November 8 due to the above debate at high level. A mission was scheduled for that night (bomb Berlin, fly on to Prague as the Austro-Hungarian forces had surrendered by then, refuel, re-arm, bomb Düsseldorf on the way back). No mission was flown – a technical expert insisted that all the engines on one aircraft be changed. The same happened the following day (but with a different aircraft). The three aircraft were about to taxi out after the second set of engine changes when an excited ground crew member ran out to stop them — the Armistice had just been declared. The Felixstowe F.2A was widely used as a patrol aircraft over the North Sea until the end of the war. Its excellent performance and maneuverability made it an effective and popular type, often fighting enemy patrol and fighter aircraft, as well as hunting U-boats and Zeppelins. The larger F.3, which was less popular with its crews than the more maneuverable F.2a, served in the Mediterranean as well as the North Sea. The F.5 did not enter service until after the end of World War I, but replaced the earlier Felixstowe boats (together with Curtiss flying boats) to serve as the RAF’s standard flying boat until being replaced by the Supermarine Southampton in 1925. The Felixstowe F series flying boats were a joint British and American development during the First World War. The predecessors of the Felixstowe were the Curtiss boats designed by a former Royal Navy officer and acquaintance of Curtiss, John Cyril Porte. The H-12 Curtiss hull, and a new production aircraft, powered by 345-horsepower Rolls-Royce Eagle VIII engines, began to be supplied to British naval air units late in 1917. This version was designated the Felixstowe F-2A. The Curtiss-built version of the F-2A was identified as the Curtiss H-16. Fifty H-12s, powered by 275-horsepower Rolls-Royce Eagle engines were delivered to the British. The design was one of the most successful flying boats of the war. Zeppelins climbed and dove quite quickly compared to airplanes. A good example is the Felixstowe F2.A, which had several early successes in downing Naval Scouting Zeppelins (two in fact). However, once the Germans identified the threat they were able to avoid the Felixstowe by simply out climbing it, which the Zeppelin did readily. This is because 60% of a Zeppelin’s cargo was water ballast, which could be dumped via electronic control from the command car, lightening the ship by up to 15 tonnes virtually instantaneously. The German Zeppelin L-22 was destroyed by an H-12 on May 14, 1917 (the first enemy aircraft to be downed by an American-built airplane) and six days later another H-12 sank the German submarine UC-36. On May 10th, 1918, an F.2A from Killingholme; flown by Captains T. C. Pattinson and A. H. Munday, engaged the Zeppelin L.62 at 8,000 feet over the Heligoland minefields. Captain Munday opened fire from the bow cockpit and Sergeant H. R. Stubbington, the engineer, also brought his Lewis gun to bear on the target. Many hits appeared to be scored, but the flying boat broke an oil line and had to land on the sea. The Zeppelin made off due east, losing height and emitting smoke, and soon afterwards blew up and fell in flames. Armament: from four to seven free-mounted 7.7mm (0.303 in) Lewis machine-guns, plus two 104-kg (230 lb) bombs on underwing racks. On 8 February 1915, the Government of India sought the assistance of Australia to supply trained airmen, aircraft and transport for service in Mesopotamia (Iraq). The Australian Government replied that men and transport would be provided, but that aircraft could not. The unit (known as the Mesopotamian Half-Flight, Royal Flying Corps) was quickly raised from senior non-commissioned officers serving at the Central Flying School and from volunteer trainee riggers and mechanics from the staff of the motor-engineering shops at the army depot at Broadmeadows. Captain Petre, the commander of the force, departed for Bombay on 14 April to make arrangements for the Half-Flight’s arrival, leaving Captain T.W. White in temporary command. White, Lieutenant W.H. Treloar, an officer from the 72nd Infantry Battalion who had learned to fly in England before the war, and 37 men departed from Melbourne aboard the Morea for Bombay six days later. The premonsoonal heat, oppressive to Australians used to moderate climates, engendered in them an unquenchable thirst. The culture and sights of Bombay took a toll on the Australians’ three months’ advance pay before they boarded the SS Bankura. The vessel was bound for the town of Basra on the Shatt el Arab, downstream from the confluence of the Tigris and Euphrates rivers in south-eastern Mesopotamia. The Australians arrived at Basra on 26 May, joining two Indian Army officers, Captains P.W.L. Broke-Smith and H.L. Reilly, and nine mechanics from the Indian Flying Corps. A New Zealander, Lieutenant W.W.A. Burn, completed the Dominion nature of the Half-Flight. An Indian Army pioneer unit had completed a road made of date palm logs from the waterway to an Arab cemetery, the only high ground in the area suitable for an airfield. The surrounding swampland was a breeding ground for mosquitoes, forcing the troops to take quinine twice daily to counter the insidious effects of malaria. The novelty of Basra, its culture unchanged from biblical days, was a marked contrast to the Australian lifestyle. The clay buildings offered little relief for the Half-Flight members toiling in the oppressive summer heat to prepare the aircraft for operations. Even by the standards of 1915, the aircraft initially supplied to the Half-Flight were not modern. With two Maurice Farman Shorthorn and a single Longhorn aircraft, with a maximum speed of 80 kph on a calm day, the Half-Flight was ordered to fly reconnaissance missions in support of the advance of forces under the command of Major General C.V.F Townshend along the Tigris River to Amara. Operations commenced on 31 May when two crews (Petre and Burn, and Reilly and Broke-Smith) flew from a landing ground south of Kurna and supplied useful intelligence to the force commander. Below them, the infantry force advanced upstream through the saturated landscape by using 500 Arab war canoes, supported by artillery mounted on barges and steamers. They succeeded in forcing the defending Turks to retreat. White and Reilly, who had battled a dust storm for two hours to fly the Shorthorn the 100 kilometres from Basra on 1 June, reported the fact to navy authorities. En route, the airmen attempted to drop three 20-pound bombs on one of the Turkish paddle steamers that was retreating in disarray. Although the bombs missed the intended target, they exploded ahead and astern of one of the smaller ships, the crew of which, having interpreted this action as the aerial equivalent to a naval ‘shot across the bows’, drew into shallow water where they waited and later surrendered to the first British vessel that appeared. Townshend took advantage of the Turkish confusion and, in company with Captain W. Nunn, Royal Navy, and 22 men, accepted the surrender of Amara in the early hours of 3 June. To guard the left flank of the advance up the Tigris River toward Kut, a force was drawn from the 6th and 12th Divisions to capture Nasiriyah, on the Euphrates River. Reilly, Treloar, Petre and Burn were again instrumental in the capture of this township. They flew Caudron aircraft that had been ordered forward from Basra over the Euphrates marshes. 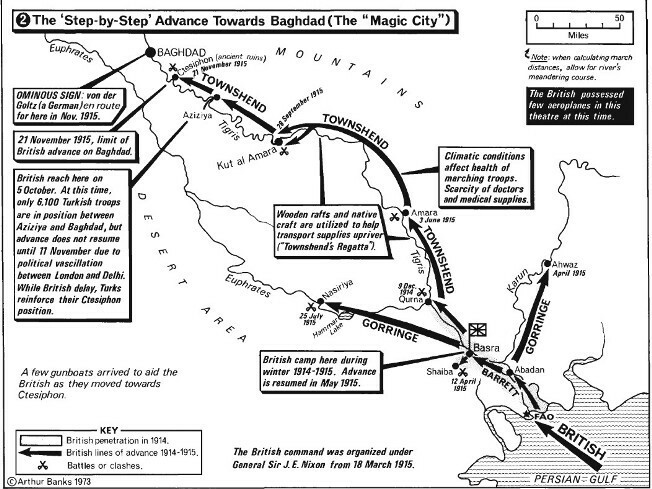 The capture of Nasiriyah paved the way for the advance on Kut. Although more suitable for training than active service, the Caudron was an improvement on the Shorthorn and Longhorn aircraft. Despite the construction of a brick engine-overhaul workshop (augmented by the repair-shop lorries that had been supplied from Australia) and an iron hangar at Basra that improved maintenance facilities, the unreliability of the aircraft engines had fateful repercussions. During the first reconnaissance flights towards Nasiriyah, Reilly had force landed in the floodwaters near Suk-esh-Sheyukh, where, with the assistance of the garrison, he was able to save the aircraft. Reilly and Merz planned to fly their aircraft back to Basra in company on 30 July to try to overcome engine problems. But the two aircraft became separated, with Reilly and his mechanic being forced to land 40 kilometres from a refilling station established at the island of Abu Salibiq. Merz and his companion, Burn, pressed on alone. They were never seen again. Eyewitness evidence suggested that Merz and Burn had landed 35 kilometres from Abu Salibiq, where a well-armed force of Arabs attacked them. The two Australians attempted to retreat to Abu Salibiq, using their revolvers in a spirited defence, killing one and wounding five of the Arab assailants, before one of the Australians was wounded. Gallantly, the two officers fought together until the end, showing great personal commitment and devotion to each other. Search parties, sent out from Basra and Abu Salibiq, found that the Caudron had been reduced to matchwood, but discovered no sign of Merz or Burn. Engine failure was a common occurrence for the Half-Flight with, as will be seen, dramatic and tragic ramifications. For the members of the Half-Flight it was a period of frustration, with tent hangars being destroyed by the ubiquitous hot, sandy winds, leaving frail aircraft subject to the vagaries of an insatiable climate. Moreover, the poor standard of workmanship at the maintenance facilities in Egypt and England meant that the engines required considerable upkeep. And yet it was also a period of innovation—to enable the Half-Flight to operate in the watery maze of the Mesopotamian river system two barges were constructed: one on which two aircraft could be transported and the second to serve as a floating workshop. Given the terrain, floatplanes would have been an asset, but attempts to modify one of the Maurice Farman aircraft to fly with floats proved unsuccessful. In August the nucleus of a seaplane flight, under the command of Major R. Gordon, was transferred from East Africa and proved its worth in the reconnaissance before and after the attack on Kut. Four Martinsyde single-seat scouts also reinforced the unit, now known as 30 Squadron, Royal Flying Corps (RFC), in August. The first of these aircraft was test flown by Petre on 29 August, who found the performance of the aircraft a disappointment—it took the aircraft 23 minutes to reach an altitude of 2000 metres, and the maximum speed of 80 kph was only a marginal improvement on the Maurice Farman and Caudron types that it supplemented. Early in September, 30 Squadron concentrated at Ali Gharbi, halfway between Amara and Kut. The squadron, due to aircraft unserviceability, could only deploy a single Maurice Farman, a single Caudron and two Martinsydes to support the Indian 6th Division’s attack on Kut. However, a series of accidents, and the capture of Treloar and Captain B.S. Atkins of the Indian Army after they suffered an engine failure while reconnoitring Es-Sinn on 16 September, reduced the aircraft strength to a single Martinsyde. To reinforce the aerial component four aircraft (all that were available) were ordered upriver from Basra on two seaplane barges. One Maurice Farman was damaged on an overhanging tree after a strong wind blew the barges into the riverbank. This aircraft was repaired in time for battle where, based at Nakhilat, it joined a Martinsyde to participate in the attack on Es-Sinn. Commencing on 27 September, Townshend instigated a flanking manoeuvre, made possible by air reconnaissance, which discovered a practical route through the marshes for elements of the 17th Infantry Brigade and cavalry to deploy against the left flank of the Turkish position. The action of this force, combined with an infantry bayonet charge, culminated in the rout of the Turkish defenders and the fall of Es-Sinn and Kut. The two 30 Squadron aircraft played a crucial role in these events, maintaining communications between Townshend and Brigadier W.S. Delamain, the commander of the flanking mobile column, before bombing the retreating enemy. With the fall of Kut, the aircraft sought indications of the enemy strength located at Nasiriyah, on the Shatt el Hai (an ancient waterway linking the Tigris and Euphrates rivers), in the marshes to the north of Kut and along the Tigris river approaches to Baghdad. These operations were hampered by the difficulty of supplying replacement aircraft and supplies from Basra, and by the fragility of the Martinsyde. Difficulties aside, Reilly found that the Turkish defence of Baghdad centred on strong entrenchments at Ctesiphon, with an advanced guard twenty kilometres distant at Zeur. A second force of 2000 cavalry and camel-mounted troops at Kutaniyeh required constant surveillance to warn of any threat to the British position at Aziziyeh, only eight kilometres distant. In addition the enemy defences at Ctesiphon and Seleucia had to be carefully mapped, a task that was undertaken on a daily basis by White and Major E.J. Fulton. These flights, due to a combination of strong winds and the slow speed of the aircraft, took about two and a half hours, and engine failures (despite regular overhauling every 27 hours), were frequent. White and Captain F.C.C. Yeates-Brown, Indian Army, undertook a photographic reconnaissance of Ctesiphon one early autumn morning. After flying at 1500 metres and evading Turkish anti-aircraft fire, the two airmen completed their mission, and turned for home and breakfast. Then the aircraft engine lost power. White opened the throttle and dived steeply for 60 metres in an attempt to remedy the problem. Initially, engine revolutions increased. White was forced to use a combination of prevailing wind, judicious use of available power and gliding to clear the general Ctesiphon area before landing adjacent to the Turkish redoubt at Zeur. The arrival of the aircraft confused the defenders long enough for White and Yeates-Brown to attempt to seek safety. Yeates-Brown, rifle in hand, stood in the observer’s seat to warn off possible pursuit and to indicate a safe passage through the broken terrain. Taxiing at speed over the cracked earth and aware of the possibility of pursuit, the airmen approached the vicinity of Kutaniyeh with some trepidation—White had dropped bombs on the troops during his previous return flights from Ctesiphon. By continuing in their sputtering aircraft along a roadway over a ridge some distance from the Tigris River, the airmen were able to bypass Kutaniyeh. Jolting overland for a further 25 kilometres, the obstruction to the fuel line or carburettor cleared, and the aircraft became airborne, miraculously enabling the crew to keep its breakfast appointment. The seaplane flight also had its share of engine failures, one of which also involved White when he flew a Maurice Farman in the search for another flown by Gordon. Gordon’s absence was particularly distressing because with him was the Chief of the General Staff in Mesopotamia, Major General G.V. Kemball. The aircraft they were flying had suffered engine failure en route from Kut to Aziziyeh, and was discovered near the river by White, close to a large Arab camp. Circling the downed Farman, White came under attack by ground fire from the camp. It damaged an aileron rib and the propeller of White’s aircraft before he landed about a thousand metres from the downed seaplane. The Australian pilot ran to the riverbank with a spare rifle, located Kemball and returned to the aircraft to take flight for Aziziyeh. Gordon, who had left the site of the downed Farman, was saved by an Indian cavalry patrol that had noticed the descent of the floatplane. White was not so fortunate on 13 November. He and Yeates-Brown volunteered to attempt to destroy telephone lines to the north and west of Baghdad before the British attack on Ctesiphon. The task involved the two airmen flying a round trip of 200 kilometres, meaning they had to carry cans of fuel on the aircraft. After bypassing the Turkish defences, White and Yeates-Brown discovered that their target ran parallel to a main thoroughfare used by bodies of soldiers in formation. The two airmen planned to land fourteen kilometres from the city where the telegraph line was within two hundred metres of the road. Locating the site, White circled to land. As he made his final approach he sighted a uniformed Turkish horseman calmly noting the landing of the aircraft, which could indicate the presence of enemy troops. Unfortunately the aircraft landed with the wind astern, forcing White to turn sharply to prevent damage to the front elevator. Despite judicious use of aileron and rudder, the pilot could not prevent the lower left mainplane colliding with a telegraph pole. White traded shot after shot with the approaching Arabs, while Yeates-Brown successfully cut the wire by igniting several necklaces of gun cotton around two of the telegraph poles. The first explosion gave the Australians a brief respite from the advancing Arabs. Returning to the Maurice Farman under Arab crossfire, the airmen decided to attempt to taxi to safety. As they started the aircraft engine, a second charge exploded, snapping the telegraph wire and causing it to flail about. As they watched in horror, the wire swung around and coiled itself onto the aircraft. The only option for the airmen was to surrender. Both men were roughly handled and only the presence of a body of Turkish gendarmerie prevented them from being severely beaten. Both men became prisoners of war. After the Turkish first and second defensive lines at Ctesiphon had been captured by Townshend’s force on 21 November, Turkish reinforcements forced the attackers to withdraw down the Tigris to Kut, where 13 000 British and Indian troops were surrounded. Two damaged BE-2C aircraft, half of the squadron reinforcements that had been sent from England, and a damaged Martinsyde remained at Kut. These had been operated and maintained by the British aircrew and the noncommisioned officers and mechanics, who joined their army colleagues in captivity. Nine Australians, of which only Flight Sergeant J.McK. Sloss and Air Mechanic K.L. Hudson subsequently survived captivity, also remained at Kut. Petre made flights from Al Gharabi over the beleaguered township to drop bags of grain (and a millstone to grind it) before he was posted to Egypt and, subsequently, to command a training squadron in England. The eight Australians at Basra were also sent to join the newly formed Australian Flying Corps in Egypt early in 1916. Mesopotamian Half Flight – Farman Short/Longhorns and Caudron G.3s. *RNAS = Royal Naval Air Service, Navy air force.